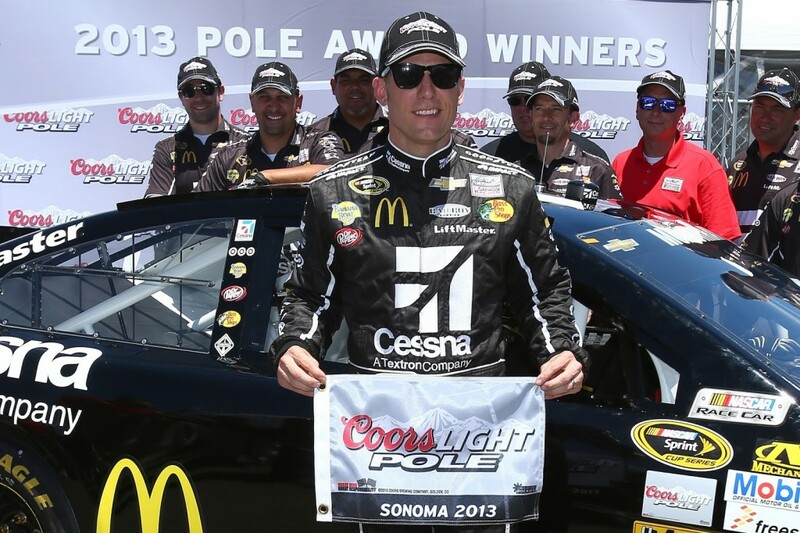 "Takin' it on the run"
A 2nd place finish, a pole, and Sprint Showdown win highlight Jamie McMurray’s 2013 turnaround. Can he catapult these results into a Chase bid? Ask any NASCAR experts about who they think will make the Chase, and you’ll probably hear the same names. One name likely missing from those lists is Jamie McMurray. He’s never made the Chase, so why should this year be any different? As the Sprint Cup Series heads to Daytona, a track he owns two victories at, Jamie enters with momentum after a much needed 2nd place finish at Kentucky. 2011 and 2012 were disasters for both Earnhardt-Ganassi cars, but McMurray has put together a solid 2013 campaign, and it could have been much better if not for mechanical issues at Charlotte, Dover, and Michigan while running top 10 at the time of the incidents. Those three potential top tens turned into disappointing finishes of 19th and 33rd twice. Those three races alone account for more than 50+ potential points lost, enough to put McMurray top 10 in the standings. That doesn’t even take into account Richmond and Sonoma, two other potential top 10s ruined by issues. Since the Chase was implemented in 2004, McMurray has been on the outside looking in every year. He narrowly missed the Chase in 2004 and 2005, but hasn’t come as close since. 2013 may be the year, if he can avoid the bad luck that has plagued him this year. With 9 races to go until the Chase cutoff, McMurray finds himself consistently in fast cars capable of top 10s, or as Kentucky showed, wins. Daytona – 2 wins, 4 top 10s; best finish of 13th since Daytona 500 win. He either finishes up front or gets caught up in the big one. Indianapolis* – 5 top 10s, 3 top 5s, 1 win (2 top 5s in last 3 years) had a successful test earlier this week. Pocono – 4 top 10s – don’t expect much more than a top 15 here. Watkins Glen – 2 top 10s, 6th in 2010 – good road racer, but lacks the good finishes to show it. Atlanta – 4 top 10s – only one since 2005 (2008); I expect better though, intermediate tracks have been particularly strong this season for Jamie. Richmond – one of McMurray’s weaker tracks, only 3 top 10s – appeared headed for 4th top 10 in April before a pit strategy gamble backfired in the last 5 laps. With 9 races to go until the Chase field is set, McMurray finds himself 19th in the Sprint Cup standings, 42 points out of the top 10. His 2nd place finish at Kentucky chopped 16 points off his deficit. And, if not for radiator issues at Charlotte and Dover, along with a cut tire at Michigan, McMurray could be sitting comfortably in the top 10 in the standings. Jamie has run much better than his points position shows. Of these 9 races, I see Indianapolis and Bristol, along with Michigan, as great opportunities for McMurray to not only run up front, but to contend for wins. I’m not as optimistic about Pocono or New Hampshire, but top 15s should not be out of the question. Ultimately, McMurray’s Chase hopes depend on mechanical issues out of the #1 team’s control. They have been quick enough and run well enough to be in the top 10 in Sprint Cup standings, but luck is a large part of racing. With a little good luck on his side, Jamie Mac could be standing on stage after Richmond with 11 other drivers hoping to win the title. If he can make the Chase, watch out. Jamie’s been great at all mile and a half tracks this year, and could be a sleeper pick for a top 5 finish in the final standings. Students are in for a real treat when they visit the lower level of the Olsen Student Center after a major summer renovation. I spoke with Shiran Nathaniel, General Manager of Sodexo at Morningside, and he explained the renovation and what students can expect this year. Some of the changes that Morningside students will notice include a wider selection of food choices at the newly named Mustang Grill (formerly called Game Time Sports Grill), a larger “grab and go” convenience store-type area, and the new Coca-Cola Freestyle machines. Another key change for the Mustang Grill is the Meal Plan Exchange Program, which will allow students to use two meals per week from their cafeteria meal plan. For example, students with the 19 meal plan will be able to use two of those weekly meals at the Mustang Grill and select from a menu set up specifically for the Exchange Program. As always, students will be able to use their flex-points. Nathaniel also said they are planning on installing an Xbox system with Kinect in the coming weeks. The new Mustang Grill will be open for students on Tuesday, August 21st for validation day. Their official grand opening is slated for September 12th. 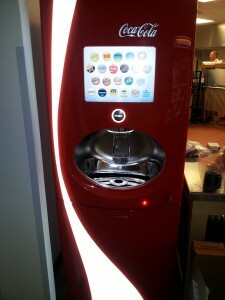 And for the video highlighting the new Coke Freestyle Machines, click here. I recently saw Joe Walsh live in concert at Riverfest in Sloan, Iowa. 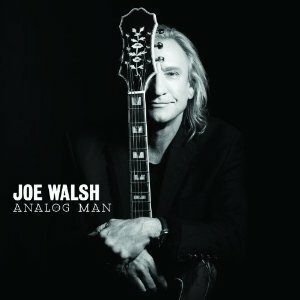 After seeing him for the first time, I bought his brand new album “Analog Man” and realized a “new Joe Walsh album” isn’t exactly a common thing. “Analog Man” is Joe Walsh’s first studio album since 1992. Joe Walsh released a solo album in 1992 titled “Songs for a Dying Planet.” I was two months old. Twenty years went by and he didn’t release any new solo albums. That all changed earlier this summer as the Eagles guitarist released the new solo album “Analog Man” in June. With no new solo albums in those twenty years, one shouldn’t assume Walsh didn’t stay productive. In the past two decades, Walsh has kept busy with the Eagles as they reunited in 1994 after a 14 year hiatus and have toured regularly since. More importantly, however, for the 64 year old Wichita, KS native, he has cleaned up his act off the stage. The seventh track on Walsh’s Analog Man album, “One Day at a Time,” highlights his recovery from alcoholism which he has been successful at since 1995. The song is an inspirational look at the man who finally realized he had a problem and did something to combat the issue. Admitting he had a problem was the first step, and it didn’t take him too long to realize where the problem was. Having lived the rock and roll lifestyle, Walsh says many of his friends are not even around anymore. The song culminates with Walsh’s perspective of his past. “It was something I was too blind to see. I got help from something greater than me. A lot has happened in the past two decades for the Kansas guitarist, even if that only includes one new studio album. And as the song “One Day at a Time” explains, Joe Walsh is still around to enjoy it when he might not have otherwise. He is living one day at a time. Have you heard about Def Leppard re-recording and forging their hits to overcome copyright disputes? Here‘s the article. I’ve mixed the original 1983 version of “Rock of Ages” to be the left channel and the new version in the right. Listen here (This will work best if you have headphones). Do you notice a difference? He may not be running for the Nationwide Series championship, and he maybe shouldn’t have even finished in the top 10, but that didn’t stop James Buescher today. The Nationwide Series heads to Phoenix next weekend along with the Sprint Cup Series. 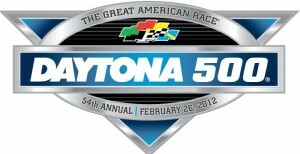 The starting lineup for the 54th running of the Daytona 500 is set. After the Gatorade Duel qualifying races, several drivers are left smiling while others think about what could have been. Before the races began, we knew that 39 of the 43 cars in the Daytona 500 were set. The top 35 in owner points were locked in, along with defending Daytona 500 champion Trevor Bayne, Tony Raines, and David Stremme locked themselves into the field with their qualifying speeds on Sunday. Terry Labonte was assured a spot by using the Past Champion’s Provisional if he was unable to race his way in. That left 10 cars vying for 6 spots in the two qualifying races. In Duel #1, Tony Stewart picked up the win over Dale Earnhardt Jr. and Marcos Ambrose, as mayhem ensued behind. Danica Patrick, making her Sprint Cup Series debut this weekend, didn’t take long to find trouble as she pounded the inside wall on the final lap of the first duel after contact from other cars. Although the wreck looked horrendous on TV, she walked away and will simply start at the rear of the field on Sunday. Juan Pablo Montoya, Paul Menard, and David Gilliland were all wiped out in an early wreck, but they will all still race in the Daytona 500 on Sunday based on their owner points, however they’ll all have to start in the rear of the field. Michael Waltrip lost control soon after pitting, and slammed into the outside wall in the first set of corners. He was unhurt in the accident, but he will not be in the Daytona 500 this year, which will make for the first Daytona 500 without him in over 20 years. Michael McDowell and Robby Gordon were both able to race their way into the 500 with their top 10 finishes in the first duel, a great feat for both underfunded, single-car teams. The second Gatorade Duel was certainly calmerand strung out as Matt Kenseth made a late pass on teammate and outside pole sitter Greg Biffle to win, which is Roush Fenway Racing’s first ever Gatorade Duel win in the team’s 25 year history. Kenseth saw the checkered flag first, followed by Regan Smith and Jimmie Johnson. The six drivers that failed to make the Great American Race were Kenny Wallace, Mike Wallace, Michael Waltrip, Bill Elliott, Robert Richardson, and JJ Yeley. The 54th annual Daytona 500 gets underway this Sunday, February 26 with the green flag flying shortly after noon central time. Kyle Busch saved it! And won the Bud Shootout?! Carl Edwards scored his first ever Daytona 500 pole. Trevor Bayne locked himself into the 54th Great American Race and will try to defend his 2011 win. And these are just a few of the headlines from an already exciting Speedweeks. The Gatorade Duels later today will determine the starting grid for Sunday’s race, which is setting up to be one for the ages. The tandem drafting which dominated restrictor plate racing in 2011 seems to have taken a back seat to the pack racing NASCAR fans had grown used to. When the checkered flag falls Sunday afternoon, a Daytona 500 champion will be crowned and another Speedweeks will have come and gone. Tune in to “On the Brinck” Monday night on Fusion 93 KMSC at 7:00 CDT as I recap the weekend with help from ThePaceLap.com’s Nathan Butler. Until then, boogity boogity boogity boys, we’re going racing again! Jesus sat on his bed, guitar in hand, and strummed away. He began playing guitar only last year after being approached to join the Morningside College campus ministry worship band. Having wanted to learn to play guitar for quite a while, he quickly said yes and was loaned a guitar by fellow student, Jackie Lincoln. Playing guitar allows him to praise the man who shares his name and reflect on a life that likely wouldn’t be as it is now, had he not strayed from the previous path. Jesus Cendejas is a noticeably different man now than he was even five years ago. Growing up in a broken household can impact children for the rest of their lives, particularly in negative ways. Whether the broken household is caused by drugs, alcohol, abuse, divorce, or combination of these and others, instability at home can have dire effects on children of all ages. For one Morningside student, this life isn’t just a story one hears on the news. It’s a life that he has lived. Luckily for him and those he has come in contact with over the past few years, Jesus Cendejas has found a new meaning in life and is living through God. In 1992, Jesus Adrian Cendejas was born in Santa Ana, California to Carina and Jesus, but moved to Mexico before turning one year old when his grandmother suffered a stroke and needed care at home. For the next four years, Jesus grew up in Mexico, being raised with common religious beliefs, superstitions, and traditions of Mexican culture. After growing up with these Mexican cultural ideals and even attending kindergarten, Jesus and his father moved back to their former home in Santa Ana in time for first grade. Soon after, his mother moved back to rejoin them. Here he struggled as he knew Spanish but was in an English speaking school environment. As would become evident over the course of his life, Jesus Cendejas overcame this challenge and eventually became fully bilingual. Unfortunately though, this language barrier wouldn’t be his biggest obstacle to overcome. Throughout his childhood years, Jesus’ father spent time in and out of jail for various misdemeanors and felonies including drug and alcohol issues. Not having his father around much took its toll on young Jesus, as he didn’t have that father-figure around to support him. Even when he was around, Jesus recalled his interactions with his father usually revolving around the drug use of his father. “When I would be with my father, he’d usually be engaged in drug use or simply around paraphernalia. The most vivid memories I have would probably be the 2AM drug deals he brought me on. I was so young, I didn’t know what was going on.” Although he initially did very well in school, being surrounded by this behavior all the time eventually took its toll on Jesus. By the time he reached middle school, Jesus now recognizes that he began following in the path of his father, beginning to take part in the same activities. He simply didn’t know what not to do, a major byproduct of growing up in a broken household. Whether directly or indirectly involved, Jesus’ life revolved around drinking, partying, gangs, and drug deals. Jesus saw it all. “It got to the point where I was just numb to life. I was that kid your mom didn’t ever want you to hang around with. It got so bad that at one point, I wasn’t even allowed in some classrooms anymore. I went from the top to the bottom academically during this time.” As a seventh grader, Jesus became a bad influence to others. “People would look up to me. Well, down, because I’m short,” he chuckled. “My friends began doing what I was doing, and many of them came from similar households as mine.” While many 12 year old boys were playing organized sports for the first time, becoming attracted to women, and playing video games, Jesus and his friends were involved in these dangerous activities. The tides began to change for Jesus soon after they began changing for his father. While in jail, his father began reading the Bible to pass the time. As a result, he would attend church services in jail. Not just his Catholic services, but any and all religious services that were available. It was at this time, that Jesus says his father saw the light of God. When his father was finally released, though, he was deported back to Mexico. During this time, his contact with his son was very limited. When his father came back to America, young Jesus noticed his father was a changed man. “He was clean. He didn’t use drugs anymore, didn’t use alcohol anymore, he was just a different man and for the better. And he did it without rehab. I see it now, but didn’t at the time. God truly changed his life. While in college, Jesus has taken a very active role in campus ministries, attending Oasis weekly, and learning guitar to play in the worship band, Inside Out. 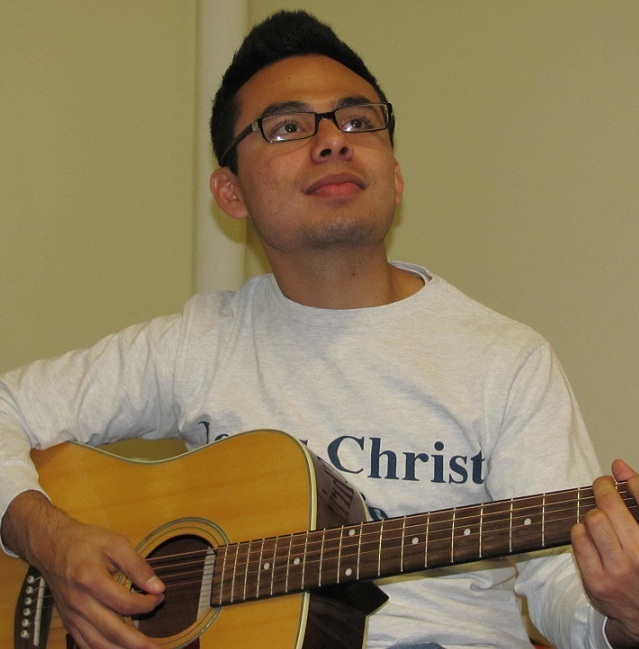 Alyssa Filipek saw potential in Jesus, and offered to teach him guitar. “He had an eagerness to learn guitar and this humble approach to applying himself in life. By working with him in the worship band and being friends with him, I’ve noticed this natural leadership about him. He has a natural influence about him.” Cendejas has become extremely involved in mission projects offered by the school. These trips have taken him to flood-ravaged Cedar Rapids, and a Navajo Reservation in New Mexico in the past 18 months, but he finds great enjoyment in these mission trips. “They allow me to truly work as the hands and feet of Jesus Christ. I’m just doing my part serving as Jesus Christ did,” Jesus said while wearing his “Jesus Christ is Life” shirt. He has found inspiration in God and is now doing all he can to live for Him. After having a less-than-stellar childhood, Jesus has found God as a way to overcome the demons of his past. He witnessed the power of God help his dad, and he has lived through this transformation as well. Being the only son of his father, he looks up to who he has become, thanks to God. It is almost ironic that a man with the name of Jesus could be so impacted by both his father and God, but that is the truth. One can believe whatever they’d like, but for Jesus and his father, they have witnessed His power and are believers because of it. Jesus is not only the son of Jesus, but one of God as well. Good evening, I’m Brian Williams with NBC Nightly N…FIRE! Approximately two hours before I posted this, the NBC Nightly News with Brian Williams aired with a little more drama than usual. I don’t know for sure if Brian Williams or Night News became a trending topic of Twitter, but for all the tweets and retweets I saw, it wouldn’t surprise me. To me, there are several interesting things about this incidents that stand out. The first thing is that this story about the news was a big deal, especially in the online world. Second, Brian Williams handled the annoyance like a pro, and Twitter users especially took notice. Once the links to the video spread, more people caught it and many commented on the poise that Williams showed. It turned out to be an ill-timed test of the fire alarms, but Brian Williams showed poise and his experience in making sure the news went on. Judging by all the tweets, this performance under pressure by Williams impressed a lot of people. This very video should be a lesson for all broadcasters in poise and control, two things necessary to be successful in the news industry. Anybody agree that tomorrow night’s ratings for Nightly News will be just a tad higher from people checking if the fire alarm was fixed? Judging by these three news stories, there is no “right” time to get married, and apparently having an out-of-the-ordinary wedding is a golden ticket to getting in the news. In this story, the scene was set in a Lewiston Rehabilitation Center, a non-typical place for a wedding for sure. The Maine couple met each other in their 60s at church and just tied the knot at the ripe old age of 87 and 88. Paul Walker is currently rehabilitating from injuray and Ann Thayer says the couple have “beautiful years” ahead of them. Story number two for this week is about a Muslim couple that married at the ongoing Occupy Wall Street protest after meeting there several weeks ago. Both are currently students looking for work or further education. The last interesting wedding story for this week is about a couple that met while running a marathon and tied the knot in the exact same way. Raymond Donaldson and Mary Martin got married in the middle the New York Marathon a couple weeks ago, with the help of a fellow marathon runner who happened to be a minister. Not to be outdone, another runner proposed to his girlfriend during this marathon.